The Zillow Mortgage Marketplace is Zillow’s mortgage offering which gives consumers access to mortgage data, mortgage resources, mortgage rates, mortgage calculators. The Zillow Mortgage Marketplace also gives consumers the ability to submit loan requests and get mortgage quotes from mortgage professionals that have signed up for the Zillow Mortgage Marketplace. The Zillow Mortgage Marketplace enables consumers that have applied for a mortgage quote to have control over which brokers they speak to. Traditionally, once a consumer submits a mortgage rate quote request, the lender would have complete control of the consumer’s contact information, the Zillow Mortgage Marketplace enables consumers to control whom they have contact with. Mortgage brokers and loan officers that sign up for the Zillow Mortgage Marketplace can gives quotes for free, but must pay for each consumer contact. Borrowers create anonymous loan requests. Lenders respond with unlimited quotes. 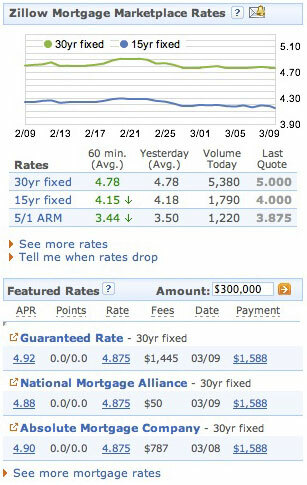 Borrowers review quotes, ratings, and profiles and then contact lenders. Choose loan requests you want to quote. Filter by loan amount, credit score, LTV, and many other factors. Get notified when loan requests match your criteria. It’s free to quote; you pay only when borrowers contact you. On other sites you typically pay for 77 leads before you close a loan. On Zillow, you typically pay for only 10 contacts before you close a loan. How do consumers contact lenders? After reviewing quotes and lender profiles, borrowers decide which lenders they want to contact. Borrowers contact lenders by e-mail or phone. Zillow records calls and e-mails for quality assurance. It’s free to quote; you pay a market-based fee only when borrowers contact you. You decide which loan requests to quote and set a maximum price to pay per contact. The market will determine the price for each contact. Contact prices will adjust and will likely range from $0-$100. Simple clicks from Google for mortgage keywords typically range from $7-$25. That’s just a click, whereas Zillow contacts are much higher quality since borrowers have reviewed multiple quotes, ratings, and lender profiles before they contact lenders. Lenders must pre-pay their Zillow accounts. To get started, a minimum of $250 is required. This is in addition to a one-time $25 application fee. When you receive contacts, Zillow subtracts the price of those contacts from your account balance. Your unused account balance can be refunded at any time. For more information and updates, you may want to check out the Zillow Mortgage MarketPlace blog. This is a pretty good service I just started with. I will let you know my feedback when I get further along with it.